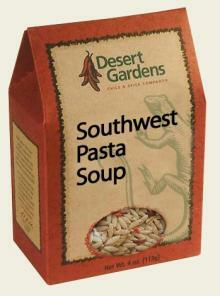 Bursting with orzo pasta, garden vegetables and Desert Gardens signature Southwestern spices, this unique gourmet style soup is simple in preparation, just add water and simmer — delicious on its own or we suggest adding 4 oz of cheese and your choice of browned ground beef or cooked chicken for an outstanding dish! 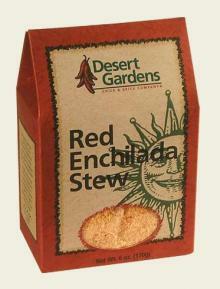 As an added attraction, serve with Desert Gardens Chile & Spice Company’s Green Chile Cornbread! This product does not contain peanuts, tree nuts, milk, eggs, fish, crustacean shellfish, or soy. Durham Wheat, Mixed Vegetables, Salt, Onion, Garlic, Spices, and Paprika. Add 4 oz of Velveeta Cheese and a 5 oz can of chicken or 8 oz browned ground beef to boiling water. Makes about six cups of prepared soup. Store unopened package in a cool, dry place. Bring 6 cups (48 oz) of water to a boil. Add pasta and seasoning packet. Simmer 12 – 15 minutes or until pasta is tender. 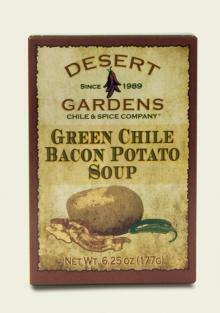 This is an awesome soup! been buying this forever, since I found it at a craft festivel. 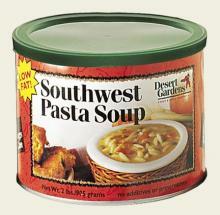 I make all my own soups except this one. We just love it. Must add the burger and cheese as suggested.